Taipei, Taiwan (Feb 1, 2019) – ATEN International, the leading provider of AV/IT connectivity and management solutions, today introduces ATEN’s new product series, the Professional Online UPS, including 8 models with 1KVA to 3KVA capacity in both 120V and 220V selection, to further provide backup power and device protection to ATEN server room solutions. The new UPS series provides more real power in watts through the industry-leading output power factor = 1 with its true double conversion topology, and full-time network and power surge protection for sensitive and important equipment. It’s ideal for small-sized ICT environments, such as small server rooms, network closets and telecom systems, to help customers create a solid and sound plan to meet demands in today’s 24/7 business and continuity-conscious world. · Output Power Factor = 1 - The ATEN Professional Online UPS series is equipped with the most outstanding power output factor, which means it has more real power in watts to power more devices. · Network and Power Surge Protection - The series delivers industrial-strength protection and reliability for your most important electronics by supporting full-time network and power surge protection with over voltage cut-off protection and surge immunity. · Remote Management Software - With Power Management Software installed on connected computers, the series allows for easy monitoring and management of backup power. · Programmable Smart Outlets – Users can easily and independently control load segments. Users can extend battery time to mission-critical devices by shutting down noncritical devices. · ECO Mode for 96% Energy Saving – Offers up to 96% efficiency to cut energy usage and costs. · Rotatable LCD for Flexible Setup – The LCD offers detailed UPS settings and information including input voltage, battery capacity, etc. Also, the rotatable LCD is suited for tower or rack setup. · SNMP, USB, RS-232 Multiple Communications – The series allows either USB or RS-232 communication ports to work with SNMP interfaces remotely and simultaneously. · Smart Battery Charger Design – The series adjusts charging voltage according to outside temperatures and extends the useful service life of batteries. · Zero Second Transfer Time - Provides true uninterruptible power with 0 ms transfer time during power failure. 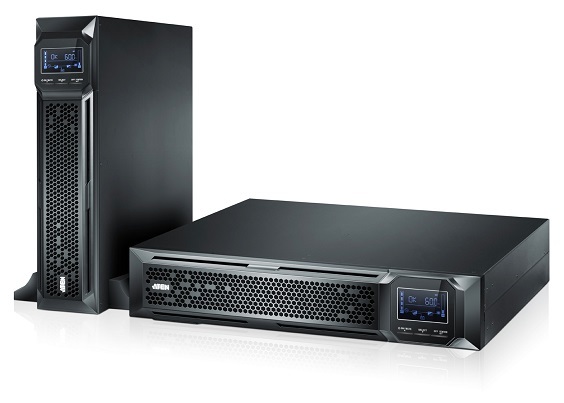 The ATEN Professional Online UPS series is now available with an extra battery pack to extend power capacity and run time for connected equipment. For more product information and availability, please visit the ATEN Professional Online UPS product page. ATEN introduces the Professional Online UPS Series with superior power output and uncompromised protection.